« West Country Apple grown during WWII – suggestions please? Early Rivers cherry at the National Fruit Collection, Kent. As we have done for a number of years, we publish the flowering dates for the National Fruit Collection at Brogdale, Kent, undertaken and kindly supplied by Lorinda Jewsbury. These are the records for a selection of varieties (standards and any new accessions) from all the tree fruit collections at Brogdale. An early start to the warm weather has really brought on the flowering for this year, as I’m sure you’re aware. The plums are roughly a couple of weeks earlier compared to last year. As an example, Victoria was in full bloom this year on 30th March – earlier than the 10th April noted for last year; the current 10 year mean (the average full bloom date) for Victoria is 8th April. 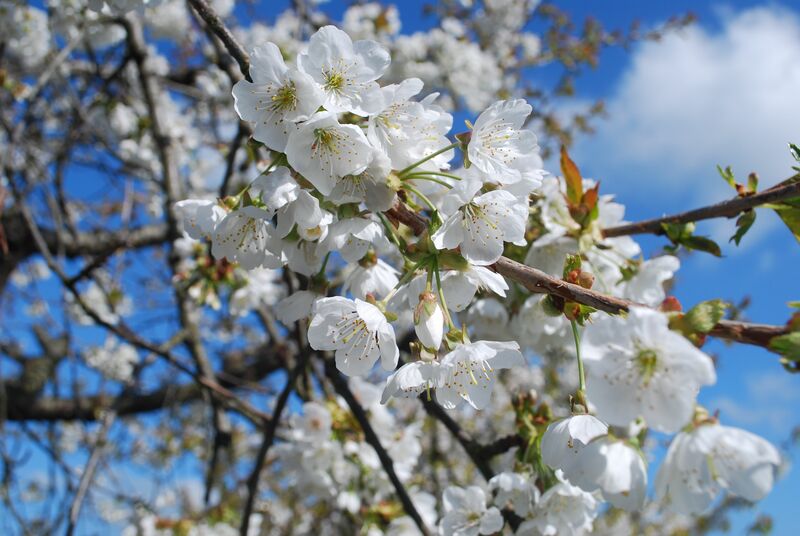 Although a number of the cherries in the Collection have yet to come into flower, the earlier varieties, again, have responded to the warm weather and Lapins reached full bloom on the 2nd April. It was the 23rd April last year and Lapins’ 10-year mean is 16th April. The pear orchard is a sea of white once more as the trees have responded to the temperatures. Louise Bonne of Jersey, one of the early flowerers in the Pear Collection, was in full bloom on the 30th March. Last year saw it at full bloom on the 15th April, pretty much spot on for its average of 14th April. The apples are just setting off and, of the early flowerers, Red Astrachan and Stark’s Earliest are already in full bloom. There is still a way to go yet with the Apple Collection and with the weather forecast to be a little cooler after the weekend there may be a fair gap this year between the early and late flowering varieties.